Majority of users hate to type program name in the search box above orb button to get to desired program. Instead, they prefer find and click routine to open programs of their choice. Incase you are feeling tired and lost while trying to find program you need to open, then checkout Start Menu 7 program. In a single click it allows you to access all programs listed in alphabetic order, resulting in easy and quick program opening. It has customized and better placed power buttons panel. With Power Timer feature you can delay any of power management operations. Besides the functionality, it looks cool. 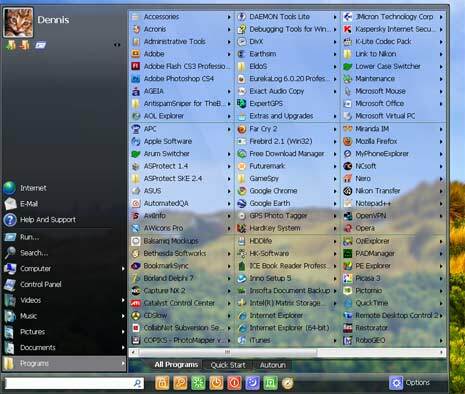 Download Start Menu 7 (also has 64 bit support).